In 2018, we focussed our fundraising efforts on local charities. Flourishers each put forward a Bristol-based charity close to their heart, and the first out of the hat was St Peter’s Hospice – a charity that cares for adults with life-limiting illnesses, aiming to improve the quality of their living and dying, while extending care and support to their families and loved ones. St Peter’s Hospice costs around £20,000 a day to run, and relies solely on donations, gifts in wills and their charity shops – making it vital for Bristolians to get involved and donate. To kick things off, naturally we held a bake sale. Each of us brought in some home baked goodness. From gluten free brownies to glutinous scones, no sweet tooth was spared. And the cherry on the cake? Our Directors generously doubled our final sum, helping us raise a whopping £244! No British summer is complete without an overzealous sporting event. So, in the summer of 2018, we celebrated the FIFA World Cup with the only way we know how – a sweepstake. Only this time, the winner was St Peter’s Hospice, adding £80 to our donations. As summer fizzled out and people started prepping their winter bods, we felt inspired to enter one of Bristol’s biggest sporting events. Our Art Director Tim ramped up his lunchtime runs and, after just two and a half weeks of training, completed Bristol’s Half Marathon in an extraordinary 1 hour 40 minutes. He also raised £450, which was 150% over his initial target. This could only mean one thing: game ON! 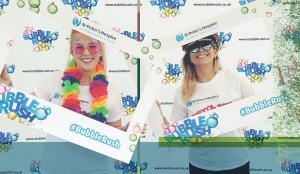 A few weeks later, Laura and India took on the annual St Peter’s Hospice Bubble Rush – a 5k run through bursts of colour, all in aid of St Peter’s Hospice. During the six months we supported St Peter’s Hospice, Flourish raised a total of £816. And we’re all pretty chuffed with that. Our next charity is 1625 Independent People – a brilliant local charity that helps young people who are homeless or at risk of homelessness in Bristol and the surrounding area. 1625IP’s goal is to empower young people so they can make changes in their lives and access opportunities which, for the fortunate majority of us, seem so normal: stable housing, homes and employment. We can’t wait to offer up our support to this fantastic charity over the coming months.